Systematic’s sophomore effort Pleasure to Burn offers much more to the devoted rock fan than any molded nu-metal band could ever provide. Systematic has come to possess the same traits of grunge legends such as Soundgarden and Alice in Chains, and uses them to the fullest extent on this latest outing. This album is endowed with some excellent vocal work from lead singer Tim Narducci. At times, singer Tim Narducci sounds like a vocal equivalent to the late Layne Staley of Alice in Chains, and creates the same engrossing, atmospheric vibe through his vocal tone and ability. “The Water Cure” is a good song to pick up on this, and is sung so well the song becomes an instant favorite. Songs like “Infected” and “Breakable” capture that familiar AiC guitar crunch, and add that grunge element back into rock after going missing for quite some time. The AiC influence is uncanny, and works perfectly into the music. The solos provided by lead guitarist Adam Ruppel piece together fluidly between each set, and are easily comparable to Jerry Cantrell’s (ex Alice in Chains). One could also compare the new sound of Systematic to Cold’s newest effort Year of the Spider, as it complements Systematic’s CD quite well in your collection. The album also seems stripped of power at times, not having nearly as much crunch and power as the band’s previous effort Somewhere in Between. The music is more melodic and compelling this time around. Some fans will enjoy this new direction, while some will feel alienated from it. Keep in mind there are still tracks like “Not like You” and “Shine” that remain aggressive, but the slower, more melodic tracks such as “Right before You” and “The Water Cure” far outshine them. The rhythm section has also been given a major boost from Paul Bostaph (ex-Slayer), with considerable additions such as the exceptional double bass drum work on songs like “Leaving Only Scars” and “Change”. 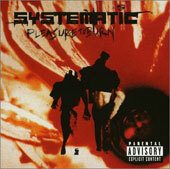 Systematic decided to experiment and grow as a band on this album, and created songs which in effect sound quite different from their previous effort, but have quickly set a new highlight in the bands history.